Here is a cool gift idea! Hurry over because right now this Parrot Jumping Race MiniDrone is just $34.99 (Reg. $149.99)! The Parrot Jumping Race is a next generation minidrone. Fast, energetic and ultra-stable thanks to wide tires, it is designed to race. With large tires specially designed to race, the Parrot Jumping Race is perfectly adapted to high-speed driving indoors and outdoors. With powerful motors and large, retractable wheels for perfect road-holding, it's a nippy little racing car that can reach top speeds of 8.7 mph! Your Parrot Jumping Race can radically change direction with 90° and 180° turns! Whatever you have it do, it has excellent grip and road-holding. Control it with your fingertips and carry out acrobatic maneuvers. It can make vertical and horizontal jumps of up to 80 cm, perform balancing acts, even clear its path by throwing objects out of its way using springs. You can even program its course in advance with the FreeFlight Jumping app! Your Parrot Jumping Race is full of surprises. Spread its wheels for optimized grip at high speeds, or put it into compact mode for increased agility. Try it out on a smooth course and get a taste for speed, or test it in obstacle mode and feel the adrenaline rush. 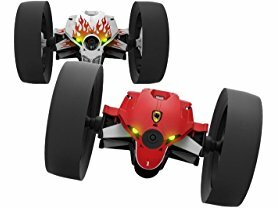 With its strong personality, your Parrot Jumping Race rolls, slaloms, turns, jumps, and reacts with sounds and lights. Take control of your drone and communicate through it via your smartphone's earpiece. Program a series of acrobatic movements, sounds and lights with the 'Road Plan' feature. You'll be at the heart of the action! Equipped with an on-board, wide-angle camera streaming live video to your control screen, you can view the world from new angles 15 cm from the ground! Explore previously inaccessible areas and save all your adventures directly on your Mini USB drive(not included). With FreeFlight Jumping, thanks to its accelerometer and its piloting interface's touch controls, your Jumping Drone responds directly to your smartphone or tablet's movements. Visible in real time on your tablet, not only can you direct the camera over 180°, you can also make it take off and land automatically. Piloting a drone has never been so intuitive!